Less doesn’t always mean less. Sometimes in life there’s an inverse relationship between resources and creativity. For instance, Einstein didn’t need the Large Hadron Collider to figure out relativity. Then again, sometimes less is less. And that’s certainly true of this promotion from Henkel. This doubletruck FSI page from August 10, 2008 is more a promotion than a cause-related marketing campaign. But there is a cause element. The page features pictures of kids heading back to school and promises that some lucky school is going to win $25,000. School cause-related marketing in the United States is a well-trod path. Both Campbell’s and General Mills do it to great effect. Henkel could do a whole lot worse than emulate either one. 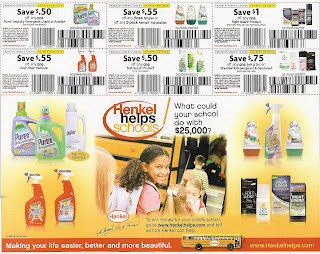 The promotion is not tied to sales of any of Henkel’s products. Rather it’s contest driven. You point your Internet browser to henkelhelps.com and write a 200-500 word essay on what your school could do with that lone prize. For one school $25,000 is a meaningful amount. But for the promotion, one prize of $25,000 is almost a joke in a country where there are 55,965 public and private schools in grades K-12. Henkel did a similar campaign last July involving the cleanup of a community. In my review I found the campaign notable for its lax copyediting. Here’s my free advice to Henkel and its agency: call a cause-related marketing professional. Call Barkley or Cone or Vert or…well… Alden Keene. But do get some help with your cause-related marketing. Because you’ve now got two strikes against you.